I’m just making this up as I go. Last night I needed to fix some dinner but my resources were low. By resources I meant will and groceries. It seems like every month there’s some expense we weren’t expecting that takes our spending budget to zero before we know it and I have to be imaginative in my cooking. After scrounging around the kitchen for several minutes, I remembered that I had some chorizo in the freezer and thought … maybe I can make empanada’s with them. 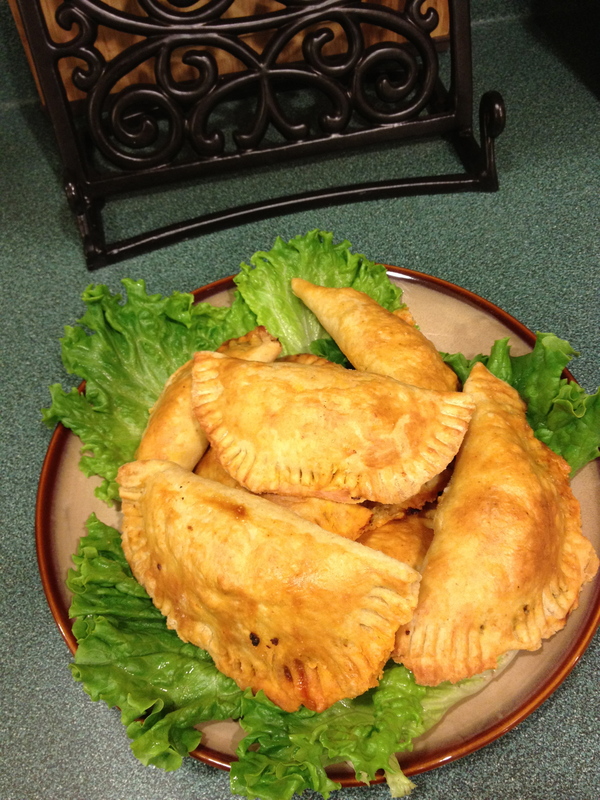 So, I got out my trusty cookbooks and sure enough, there was a recipe for chorizo empanadas in one of them. I promptly closed the book and got to work. Who needs a recipe when you can just whip them up on the fly? They were so simple to make. Yes, there was some time involved in rolling out the individual pastries, it’s worth the extra effort. I think the total time to prepare these was about and hour and a half. 1. Make a pastry dough using 1-1/2 cup flour, 1 tsp salt, 1/2 stick very cold butter, 2 tbsp Crisco, 6 tbsp ice cold water. I use my food processor to mix all this together. Form into a cylinder wrap with plastic wrap and set in the fridge for 20 – 30 minutes. 2. Saute one small onion with 1 lb chorizo. Once meat is browned add 1 cup corn and 1 cup black beans. Cook altogether until good and hot. Turn off heat and get dough out. 3. Cut dough into 10-12 portions, roll each out on a floured surface (one at a time) add a spoonful of pepper jack cheese, a spoonful of meat mixture, coat the edges of the rounds with egg white, fold dough over, seal with a fork and then baste the entire thing with egg white. 4. Bake in a 400 degree oven for 20 minutes or until golden brown. I baked mine on my Pampered Chef stoneware. Derek loved them the pastry was perfect and although they’re not “perfectly” formed they were quite delicious!